February 6, 2019 · Due to parent teacher conferences, our February chess clinic will be canceled. We will be having a clinic in March, so check our facebook page for upcomming details. Facebook page. November 27, 2014 · Don’t forget! Our next Free Chess Clinic is Monday, December 8th at Maggie L. Walker Governor’s School from 5–8PM in the cafeteria. This month’s clinic will feature special guest Grandmaster Sergey Erenburg, who will conduct a simultaneous chess exhibition. Please use the Leigh Street entrance and enter through the Bluestone Lobby. As always, all scholastic players are welcome and we hope to see you there! Event details. Photo Credit: Alexandra Welch Edlund, Richmond Times Dispatch. November 14, 2014 · Registration for the Summer 2015 Dragon Chess Camp is now open! Register. 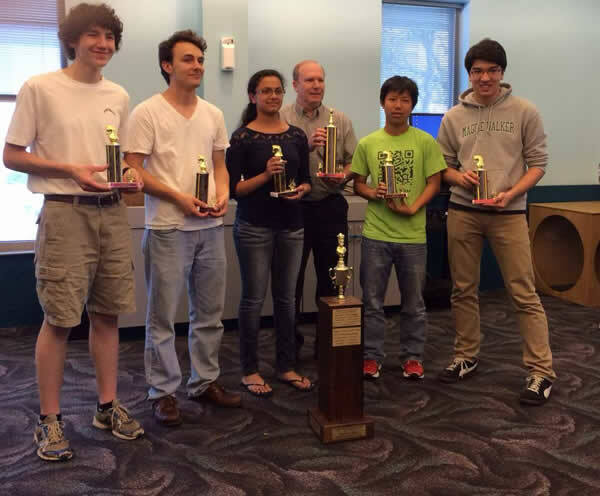 May 10, 2014 · MLWGS has repeated as the Virginia High School Chess League Champions! MLWGS beat Norview High School in the League semi-final 5–0 to set-up a re-match against Godwin High School in the League Final. In regular play against Godwin, Bryan Kaperick and Charles Yang both won their matches, while Isaac Steincamp drew, sending the match into tie-breaks with a score of 2.5–2.5. In tie-break play, Isaac Steincamp, Shreya Shetty, and Charles Yang each won, out-scoring Godwin 3–2, with the final score MLWGS 5.5–Godwin HS 4.5. 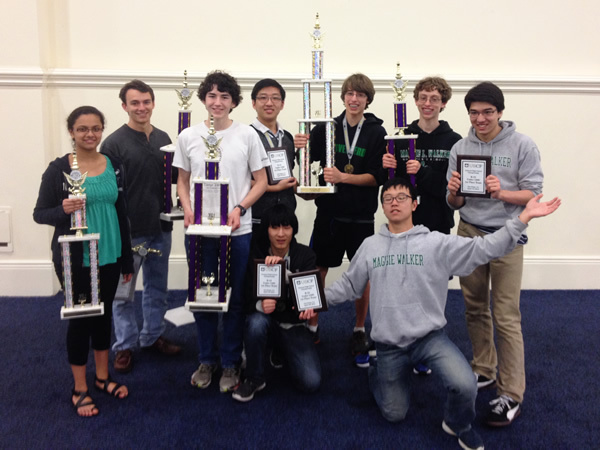 This is the second consecutive year MLWGS has won the Virginia High School Chess League Championships, as last year the Green Dragons beat Loudon Valley High School in the League Final 4–1. April 28, 2014 · The Maggie L. Walker Chess Club is offering a free chess clinic open to all scholatic players in the greater Richmond area. Join us for some informal chess lessons and the play friendly games with the MLWGS team and other scholastic players! This month, team captain Isaac Steincamp will present “The Games We Should Have Lost” from some of his most recent games. The clinic is from 5–7PM in Room 111 at Maggie L. Walker Governor’s School. Green Dragons Win U1200 National Championship! April 6, 2014 · San Diego, CA. The Maggie L. Walker Chess Team had a great weekend in San Diego, as the Green Dragons achieved several major milestones. Of the nine MLWGS players attending the USCF National High School Chess Championships, seven played as a team in the U1200 section and won—making this the first national chess championship for the Governor’s School. In the individual competition, Bryan Kaperick placed 4th overall with a score of 6.0/7, and Bobby Grayson took 9th with the same score. Freshmen Matthew Normansell and Jeffrey Song also had incredible performances, finishing 12th and 53rd respectively. In the Championship section, junior Isaac Steincamp scored 4.5/7, tying for 49th place. 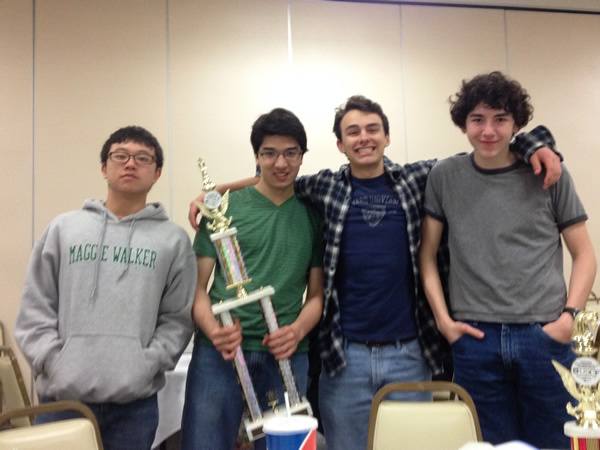 The Green Dragons also made a strong showing at the National High School Blitz Chess Championships, finishing in 9th place overall. Isaac Steincamp finished with a score of 7.5/12 and 50th overall in the individual competition, while Bobby Grayson tied for 57th place with a score of 7.0/12, earning him the third place U1200 award for his performance. March 31, 2014 · The Maggie L. Walker Chess Club is offering a free chess clinic open to all scholatic players in the greater Richmond area. Join us for some informal chess lessons and the play friendly games with the MLWGS team and other scholastic players! The clinic is from 5–7PM in Room 111 at Maggie L. Walker Governor’s School. March 16, 2014 · Roanoke, VA. 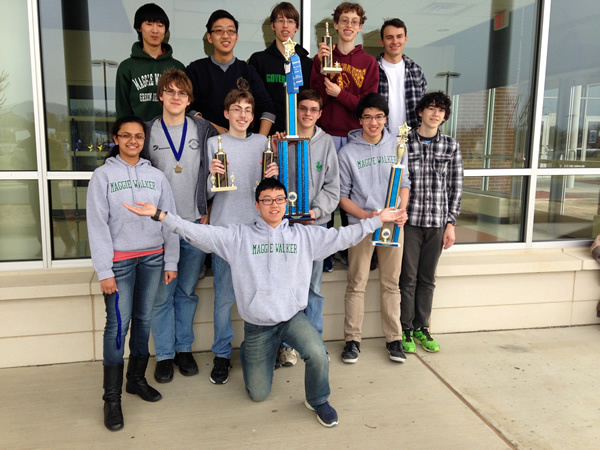 The Maggie L. Walker Chess Team took second place in the K–12 section of the Virginia Scholastic and Collegiate Chess Championships this weekend in Roanoke—the highest ever finish for any MLWGS chess team at States! In individual competition, junior Isaac Steincamp scored 4.5/6, earning eight place (tied for fifth), and freshman Shreya Shetty scored 3.5/6 as for a 24th place finish (tied for 22nd). In addition, senior David Clayton won the Top U1400 award, with 3.5/6 and a 25th place finish (tied for 22nd), and freshman Matthew Normansell scored 3.0/6 to win the 2nd place U1100 award. All in all a great weekend to be a Green Dragon! January 6, 2014 · Registration for the Summer 2014 Dragon Chess Camp is now open! Register. January 3, 2014 · Mark your calendars! The next MLWGS Free Chess Clinic is Monday, January 13th from 5–7PM. 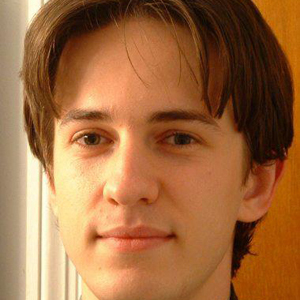 This month we are pleased to present a special guest: Grandmaster Sergey Erenburg who will conduct a simultaneous chess exhibition for scholastic players and families! This is a really unique opportunity as GM Erenburg is one of the top six players in the country. In addition to the chess simul, Mike Hoffpauir from the VSCA will present a special session “How to Start a Scholastic Chess Club at Your Child’s School” from 6–7PM. Special thanks to Capital One and the VSCA for providing volunteers for this event. As always, the clinic is free and open to all scholastic players, and there is no need to register! We hope to see you then! Complete event details.